The past few months have flown by in a fury. 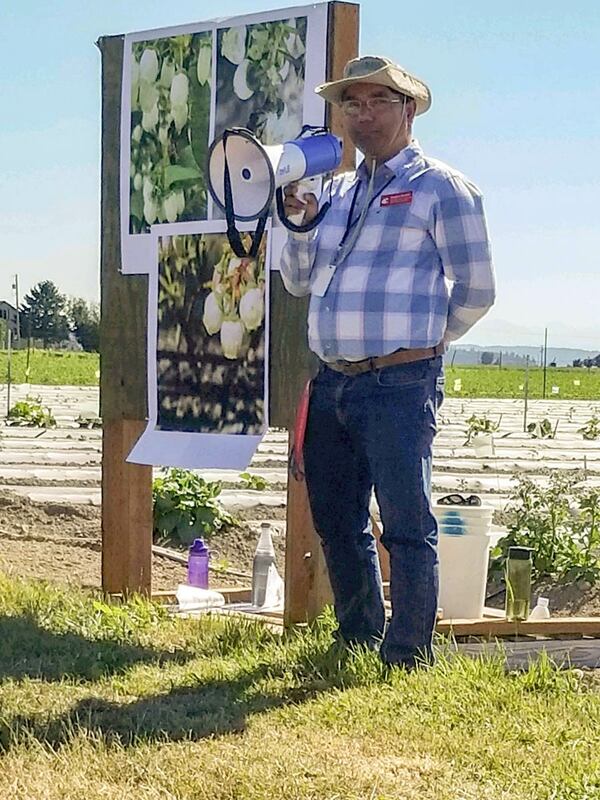 NWREC faculty, staff and students continue their excellent work in support of the agricultural communities of northwest Washington and continue to be recognized for their excellence. One of the most enjoyable aspects of directing this Center is the opportunity to brag about the important work that great people at the Center are doing. Over the past few months we have hosted numerous groups for visits to the Center to talk about our facilities, programs, people and impact. These included the WSU Branch Campus Chancellors and Advisory Committees, numerous student groups from elementary to graduate school, farmers, visiting scientists, government relations staff from Washington’s five public universities, members of the community, donors and our new College Dean. In the rest of this newsletter, you’ll get updates on a number of things happening at the Center. One opportunity for local community members to learn more about the Center is through our Brown Bag Seminar Series. The upcoming seminars are posted on our website and include both opportunities to hear from our graduate students as well as from visiting scientists and guests. This is a great opportunity to see the work of students first hand and help them “practice” their presentation skills, as well as to learn more about interesting topics from colleagues and partners around the area, state and world. One of the challenges of NWREC’s success is that we have grown and stretched past the capabilities of our facilities. Even with the move of the Bread Lab to the Port of Skagit, we continue to be challenged by the lack of sufficient space to conduct all of the activities that our faculty have been funded to work on. Our most immediate space constraint is plant growth facilities (both greenhouse and growth chambers). We are in the midst of significant facility modifications and updates to increase our growth chamber capacity to better facilitate important controlled atmosphere experiments. 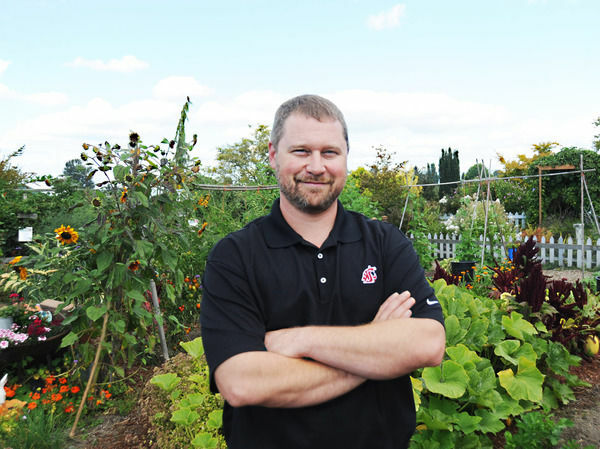 Also, earlier this year, the Skagit Men’s Garden Club made the initial investment in the development of a new greenhouse facility for NWREC. This was followed by support from Skagit County through their Economic Development Grant program. We are planning this greenhouse facility development as a phased project and are still encouraging donor support to continue with the expansion. Deirdre Griffin (left) and Gabe LaHue (right). Finally, I am pleased to announce a successful faculty hire for the WSU Mount Vernon Soil Health Program. 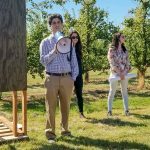 Many people within and outside WSU worked really hard to make this dream come true, and we are very pleased to be joined by an amazingly talented young scientist, Deirdre Griffin… and her fiancé Gabe LaHue. Please see my Introducing our new Soil Scientists article for more information. We invite you to join us at a reception to welcome Deirdre and Gabe on Tuesday, August 21 at 2pm in the NWREC lobby. 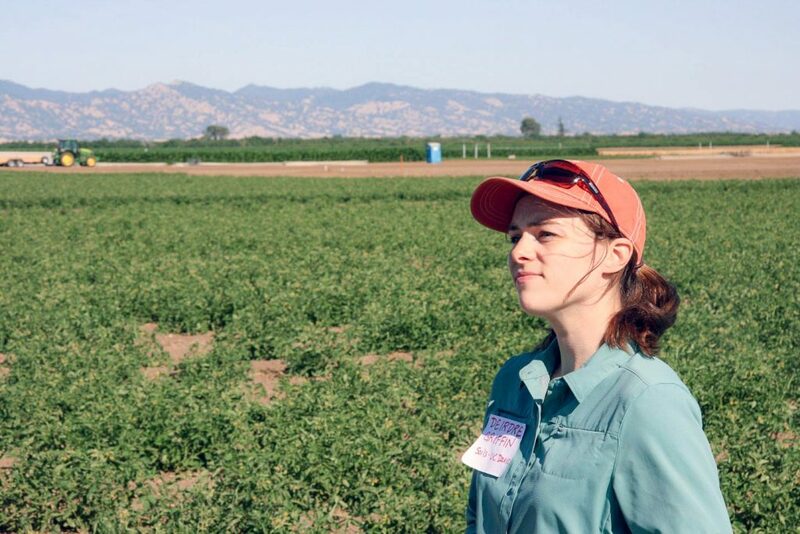 Deirdre Griffin comes from the Soils and Biogeochemistry Graduate Group at UC Davis. Good things come to those who wait. 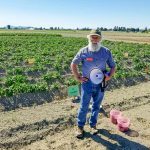 Anyone who followed the work at WSU Mount Vernon knows that hiring a soil scientist has been high on the priority list for a long time—but the opportunity never seemed to materialize. 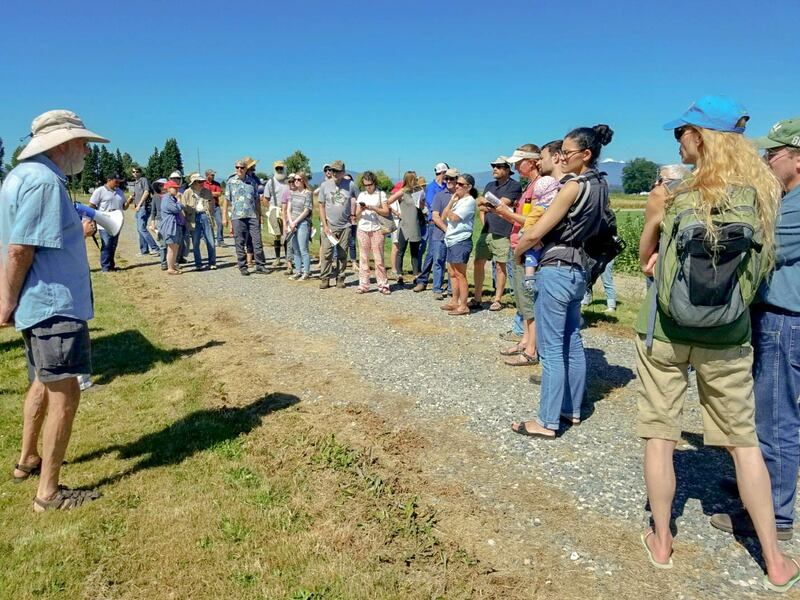 When I agreed to come to Mount Vernon as Director three years ago, I made it clear that hiring a soil scientist was a critical investment for the future of the Center and our work supporting the agricultural industry of Northwest Washington. At several points over the past three years the waiting felt excruciatingly painful. 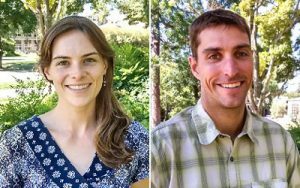 However, I am pleased to announce that we have only a little longer to wait (January 2019) until not one, but two soil scientists join the faculty at WSU Mount Vernon! And now, it’s easy to see that the wait was worth every minute. I want to thank all of our partners who worked to support our efforts to recruit and hire Deirdre Griffin and Gabe LaHue. Deirdre and Gabe are both wrapping up their Soils Ph.D.s at the University of California, Davis and will be joining us in Mount Vernon on January 1, 2019. 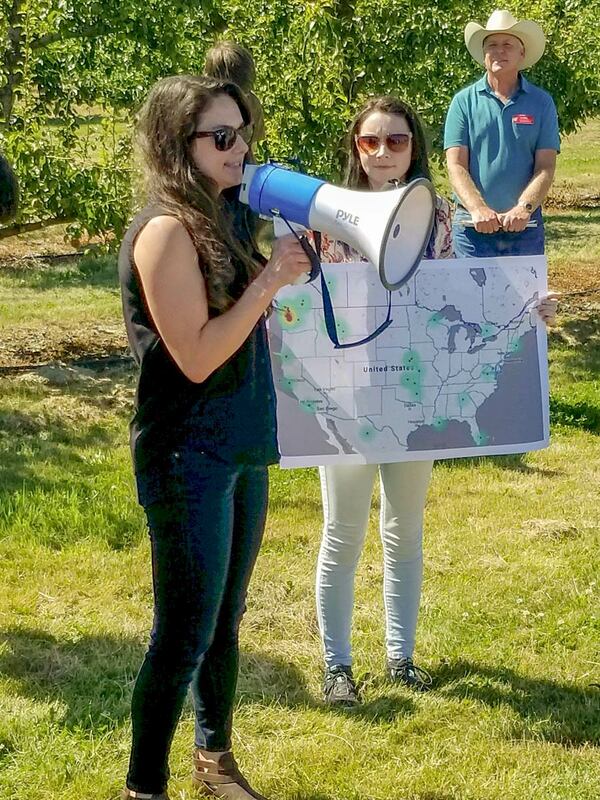 Deirdre will be an Assistant Professor building an integrated research and extension program on soil health in northwest Washington and will have a teaching role in our degree program offerings at the WSU Everett campus. Gabe will be a Clinical/Research Assistant Professor with a 50:50 teaching/research position with a focus complementary to Deirdre’s soil health program. Deirdre and Gabe will be visiting Washington one more time in August to attend New Faculty Orientation and to visit farms in the area. We will be holding a welcome reception for Deirdre and Gabe on Tuesday, August 21 at 2pm in the NWREC lobby. More detail on Deirdre and Gabe is included below. Deirdre Griffin is currently a Ph.D. candidate in the Soils and Biogeochemistry Graduate Group at UC Davis, where she investigates the impacts of agricultural management practices, such as compost amendments, cover crop use, and precision irrigation, on soil nutrient cycling and the microbes responsible. She enjoys thinking and working across scales to understand how soil management affects micro-scale interactions and how those in turn feed back to the overall productivity and health of the cropping system. Deirdre has gotten to dig in soils from California to Colombia to Malawi to Maryland, and she’s looking forward to exploring and understanding Washington’s soils and agricultural systems. 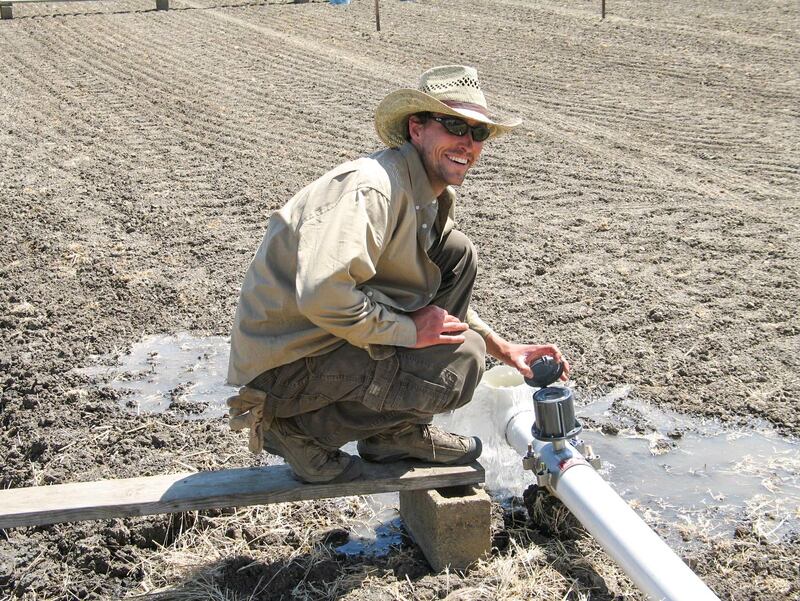 Gabe LaHue is a Ph.D. candidate in the Soils and Biogeochemistry Graduate Group at UC Davis. Gabe LaHue will be joining us from UC Davis, where he is a Ph.D. candidate in the Soils and Biogeochemistry Graduate Group. His research focuses on agricultural water management, soil hydrology, and nitrogen management. 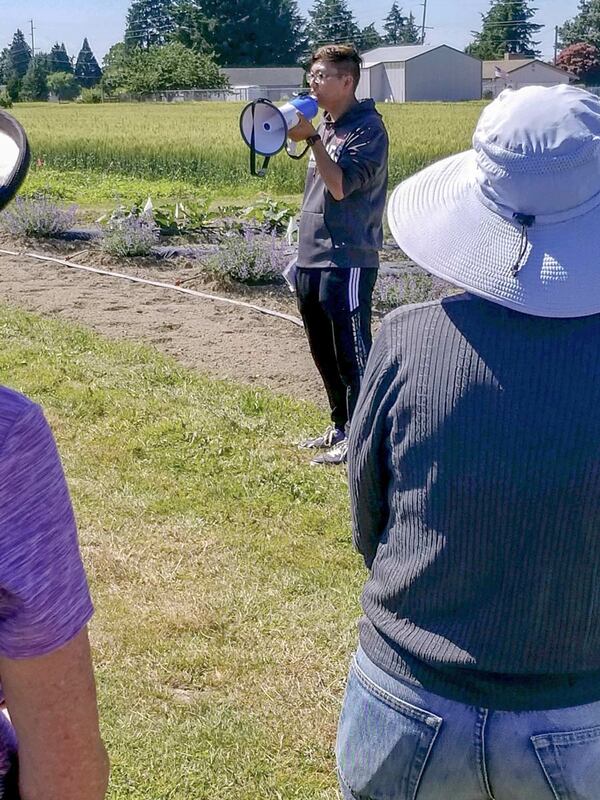 For his Ph.D. work, he evaluated alternative water management strategies for California rice production, investigated subsurface water flows (seepage and percolation) in rice fields, and quantified the effect of different nitrogen and water management practices on greenhouse gas emissions. Gabe also has a strong interest in teaching and most recently taught soil physics at UC Davis. Gabe received his master’s degree in International Agricultural Development from UC Davis in 2015, was a Peace Corps Volunteer in Paraguay from 2010-2012, and earned his bachelor’s degree in Plant Science from Cornell University in 2010. 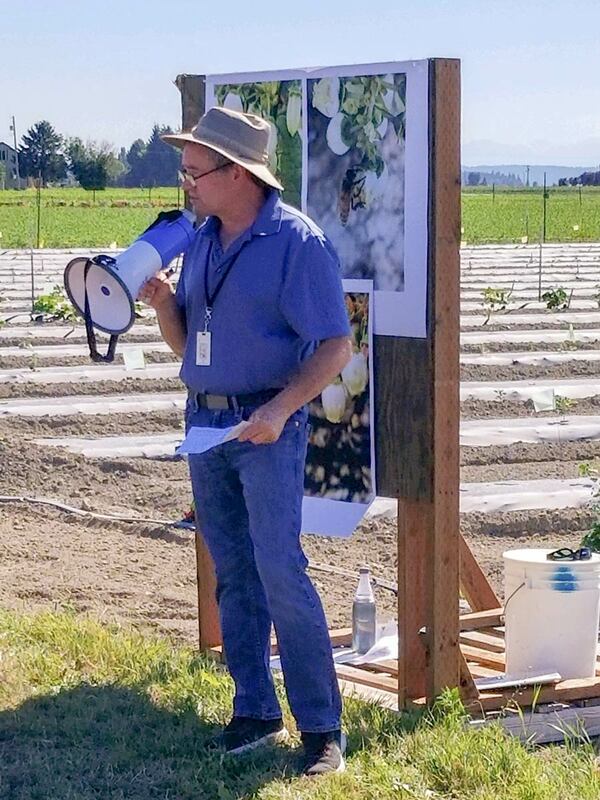 He looks forward to working with local farmers and collaborating with WSU researchers across the state. 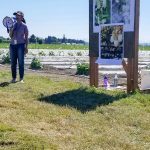 We held the WSU Mount Vernon NWREC Annual Field Day on July 12, 2018. 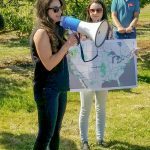 At 3:00 pm faculty, staff and graduate students hosted a walking tour of some of the nearly 150 acres of active research plots at the Center, describing current research projects and how work at the Center impacts growers, consumers, agricultural businesses and local economies throughout the region. At 4:45 pm participants convened for a poster session in the Sakuma Auditorium to provide additional opportunity for more in-depth questions, and some remarks from Northwest Agricultural Research Foundation Board Members Alec McErlich and Anne Schwartz. We were also joined by the new Dean of the College of Agricultural, Human, and Natural Resource Sciences, Dr. André-Denis Wright, who was able to listen to graduate student presentations and learn about the diversity of research activities in Mount Vernon. Dean Wright incorporated his visit with us into a larger western Washington tour. For further details on his introduction to our region, see the article published by WSU News. 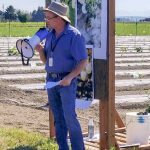 Perhaps one of the most interesting factors of the NWREC Field Day each year is the incredible diversity of the research projects and crops that are featured. 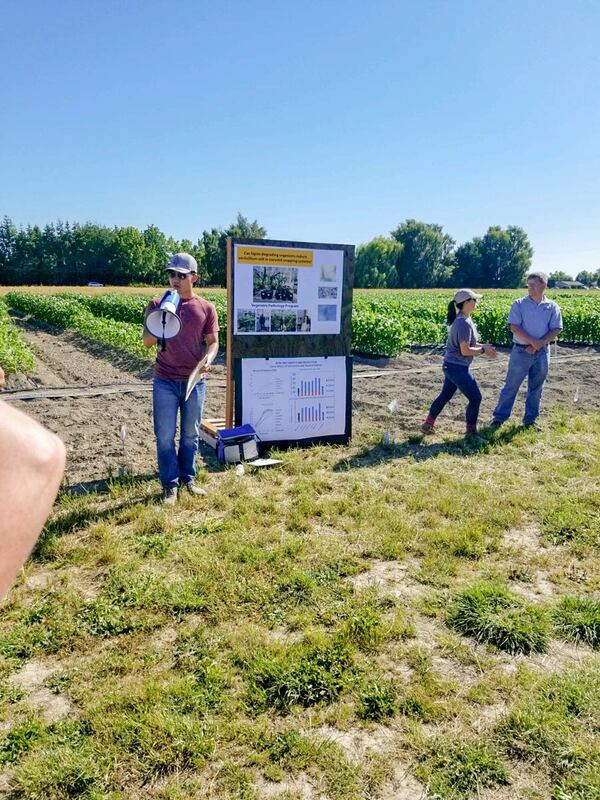 More than 15 different crops were presented on during the field tour, and even more crops were discussed during the poster session. 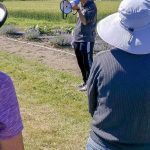 If you have never joined us for the Field Day before, or if it has been a while since you joined, I would welcome you to put a hold on your calendar for July 11, 2019. Everyone did a great job, but the graduate students were particularly impressive. 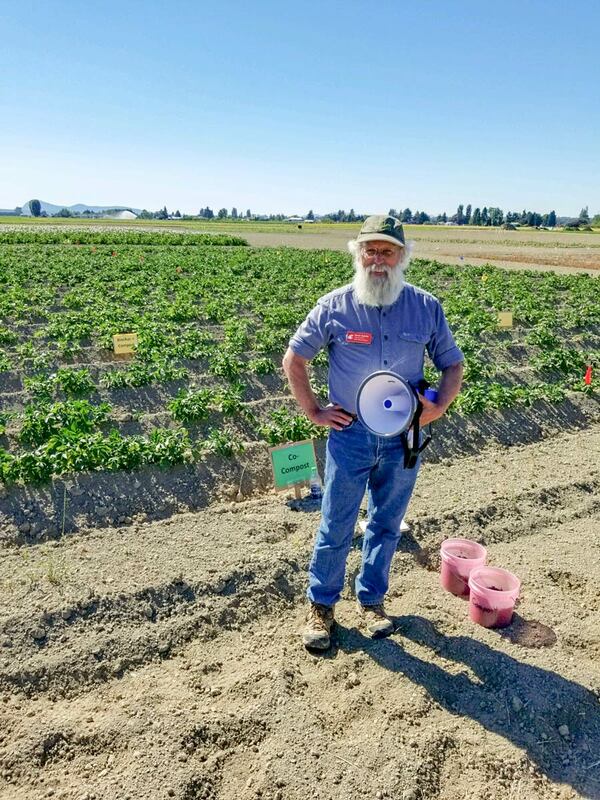 Not pictured: Plastic mulches in red raspberry (Huan Zhang), Cover crop impact on potatoes (Don McMoran), Can lignin degrading organisms reduce verticillium wilt (Lydia Tymon). 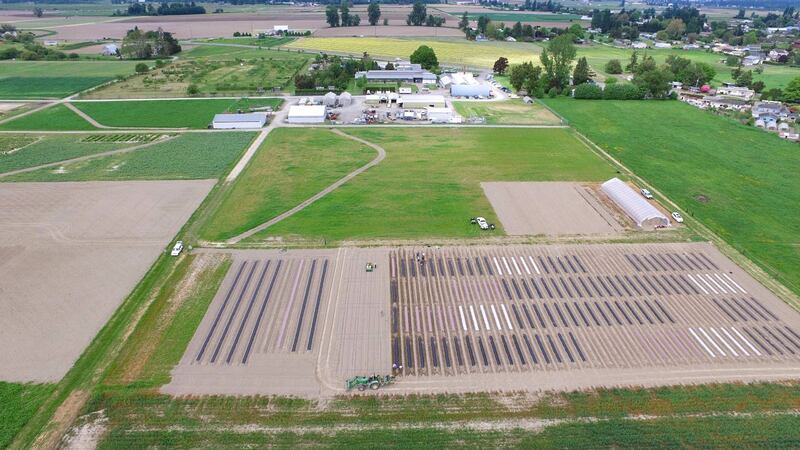 Aerial view of the USDA SCRI plastic mulch trial. Photo by Chris Benedict, WSU Extension. 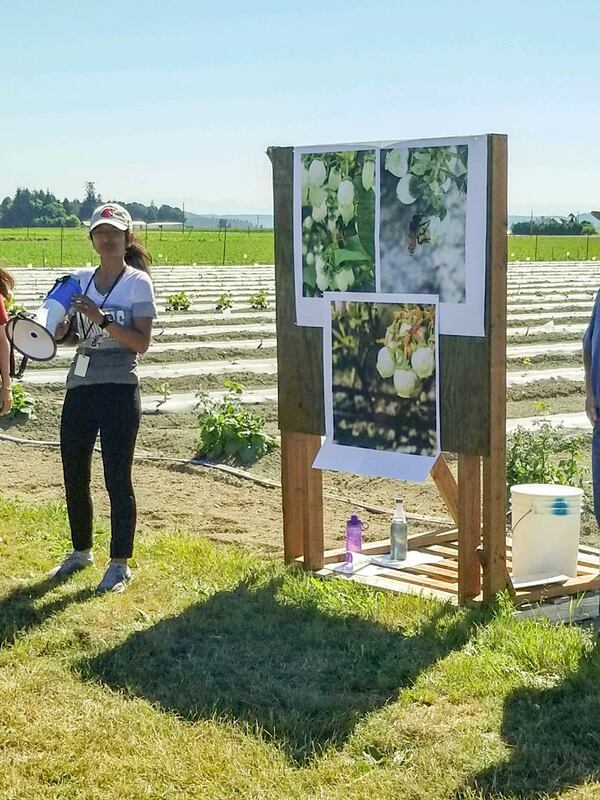 WSU Mount Vernon faculty, staff and students have been working on a large, multi-state USDA Specialty Crop Research Initiative (SCRI) project evaluating the use of Biodegradable Plastic Mulch in vegetable cropping systems. Plastic mulch is used to suppress weeds and conserve water when growing specialty crops, like pumpkins, tomatoes, and strawberries. Biodegradable plastic mulches (BDMs) have been developed as a substitute for conventional plastic mulch to reduce removal, storage, and disposal issues and costs. The widespread use of BDMs is limited by lack of knowledge and by concerns about their unpredictable breakdown and potential residues. 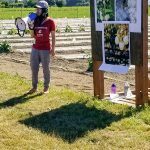 Our research team of 19 scientists from three universities is taking the lead to investigate these issues in a field experiment at Washington State University Northwestern Washington Research and Extension Center (NWREC) in Mount Vernon and the University of Tennessee in Knoxville (UTK). In our on-going five-year field study (we are currently in year 4), we tested six BDMs in years 1–2, and seven BDMs in years 3–5 (Table 1). In all years, the field experiment included two treatments for comparison with BDMs: polyethylene (PE) mulch and no-mulch. In the first two years, ‘Cinnamon Girl’ pie pumpkin was grown as the test crop at both locations (discussion of pumpkin as a test crop (pdf)). BDMs remained intact throughout the growing season both years and suppressed weeds similarly to the PE mulch. An important finding was that paper BDM, which is one of the treatments, was the only mulch to suppress nutsedge. Overall average pumpkin yield was 8 tons per acre at both WSU NWREC and UTK, but at WSU NWREC yield was 40% greater with mulches than for bare ground whereas at UTK there was no difference in pumpkin yield due to mulch treatment. 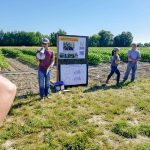 Yield differences at WSU NWREC was likely because the soil temperature (5 inch depth) was 2 °F higher with mulch (70 °F), which was more favorable for pumpkin growth, but at UTK soil temperature was 77-82 °F for all treatments. Mulch adhesion is an important consideration with BDM, and was defined in our experiment as fragments of mulch measuring 1 cm2 or greater adhered to the fruit such that pieces would not wipe off easily. Marketability of fruit can be reduced due to mulch adhesion. At WSU NWREC, with BDMs approximately 50% of the pumpkin fruit had mulch adhesion whereas at UTK only 8% of the fruit had mulch adhesion. This difference was because at WSU NWREC fruit set was on the mulch whereas at UTK fruit set was in the alleyways due to longer vine length (even though the same cultivar was grown at both locations). In years 3 and 4, sweet corn is being grown at WSU NWREC while bell peppers are being grown at UTK. Results from year 3 indicate sweet corn yield is following the same trend as pumpkins at NWREC such that yield is 52% greater with mulch than for bare ground. Of additional interest is that first harvest of sweet corn grown with mulch was 1 week earlier compared to bare ground. At UTK, there was a difference in mulch product impact on yield of bell pepper as four mulch products had yield similar to bare ground and three mulch products had yield less than bare ground. Similar to sweet corn, harvest was up to 2 weeks earlier with mulch compared to bare ground. 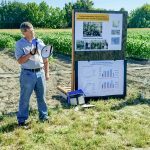 Additional research at WSU NWREC includes the development of a soil sampling protocol to assess how much mulch remains in the field after soil incorporation each year. 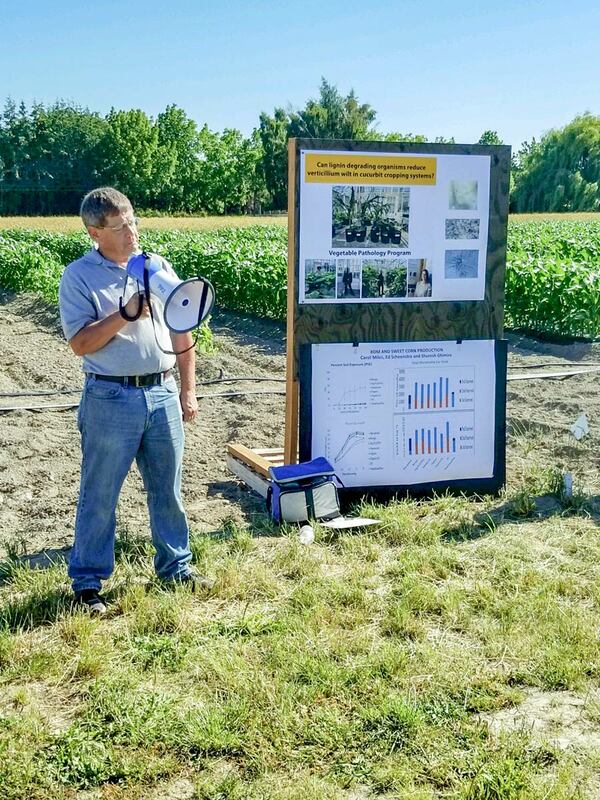 Further research at both sites includes assessing soil quality, soil moisture, plant pathogens, mulch physiochemical properties due to weathering, economics, and on-farm utilization. Our project website includes fact sheets and journal articles that we have published based on our results. 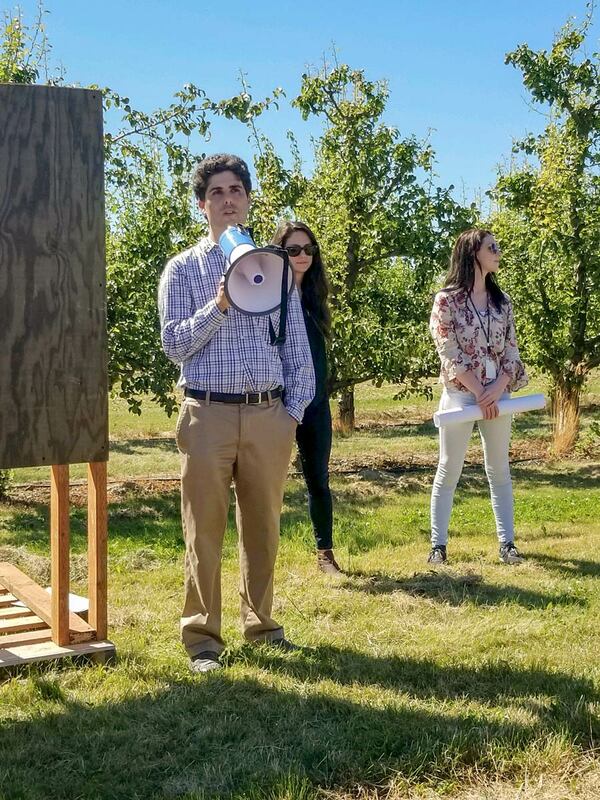 The project Performance and Adoptability of Biodegradable Plastic Mulch for Sustainable Specialty Crop Production is funded by the United State Department of Agriculture (USDA) National Institute for Food and Agriculture, through its Specialty Crop Research Initiative, under award 2014-51181-22382. Any opinions, findings, conclusions, or recommendations expressed on the website “Biodegradable Mulch” are those of the site authors and do not necessarily reflect the view of the U.S. Department of Agriculture. Table 1. Information from manufacturers for the mulch treatments at Mount Vernon, WA. 1 PBAT = poly(butylene adipate-co-terephthalate), PLA=polylactic acid, PHA= polyhydroxy alkanoate). 2 Composition (%) of mulch that is from biological products or renewable materials, reported by each company for their product. 3 The bare ground treatment was managed with herbicides so it was weed-free: Outlook 1.1 L.ha-1, and Callisto 0.37 L.ha-1 on 24 May 2017, and Atrazine 2.3 L.ha-1, Callisto 0.18 L.ha-1, and R-11 1.2 L.ha-1 on 22 June 2017. 4 Not available commercially, prepared for this study by Metabolix, Inc., Cambridge, MA. 5 Included only in years 3-5 of the study. Members of the multi-state W-2008 team, pictured above at their annual meeting in Grand Rapids, Mich., have won a regional award for efforts to protect the onion industry. Photo courtesty of CAHNRS News. 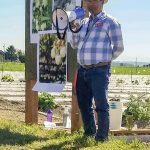 Researchers evaluate onions at a WSU Onion Cultivar Trial and Storage Evaluation in Pasco, Wash., part of the 5-year project. 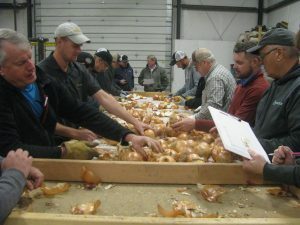 Bulbs are harvested, stored, and evaluated for storage qualities and disease. Photo courtesy of CAHNRS News. 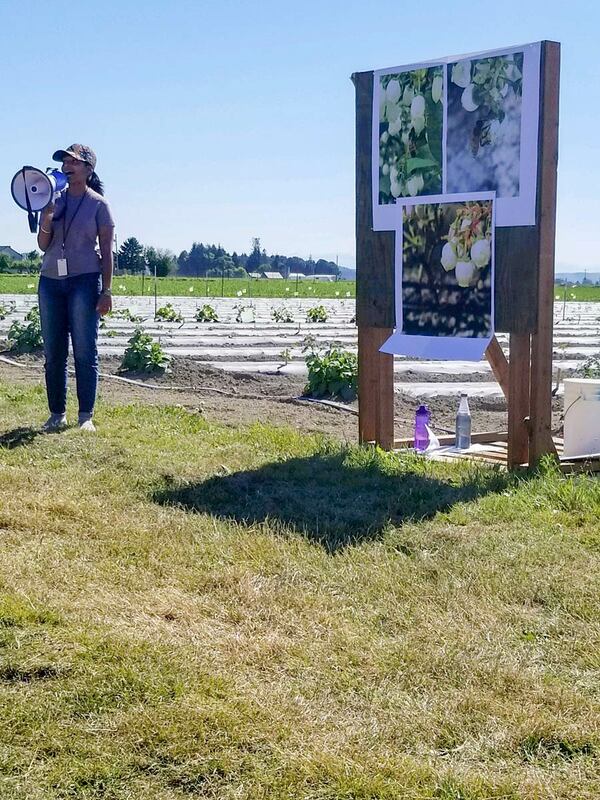 WSU Mount Vernon’s Lindsey du Toit is a member of a multi-state team that recently received the U.S. Department of Agriculture’s Western Region 2018 Excellence in Multistate Research Award for their activities to support disease management in onion production. Congratulations to Dr. du Toit and her team on this prestigious award! Read more about the award and the research that earned it from CAHNRS News. 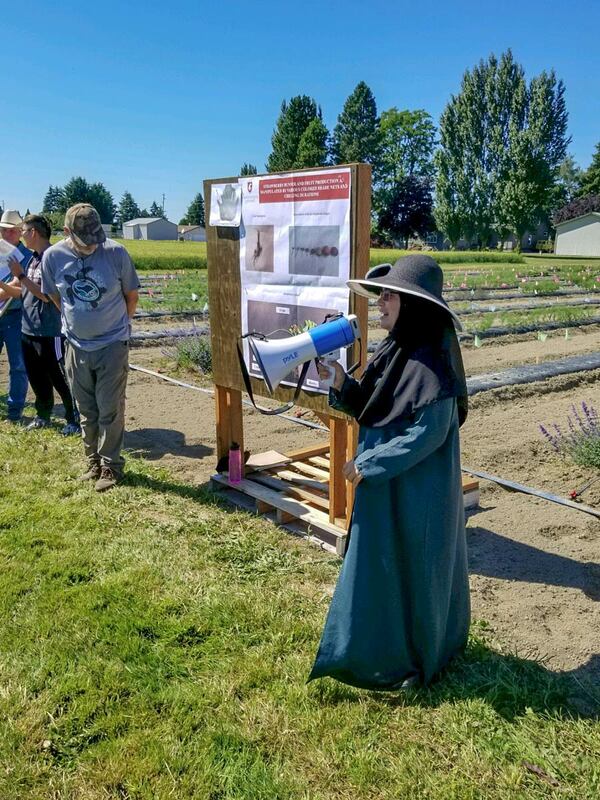 The Organic & Sustainable Agriculture (OSA) program at WSU Everett will begin instruction for Fall 2018 this August. The program is welcoming three undergraduate students in its inaugural class for the first semester with two most likely joining in the spring. 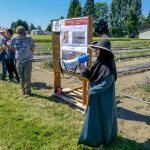 Small undergraduate classes are common for new programs, and there is a great potential for growth as potential students are made aware of the educational opportunities in agriculture west of the Cascades. WSU Everett degree programs are based on a 2+2 system where the student completes the first two years of the undergraduate degree at a community college then transfers to WSU Everett with junior standing. OSA transfer students have completed the general education “UCORE” requirements along with a full year of chemistry and biology courses. Articulation agreements have been completed for Skagit Valley College and Everett Community College, and more of these agreements are currently underway. Students at these and other institutions work with their advisors and WSU program staff to create an individualized study plan. 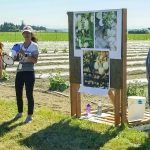 The program is making use of state-of-the-art distance-learning technology to exchange courses with WSU Pullman while creating more of a focus on the unique agricultural systems located on the west side of the state. In addition, this distance-learning technology allows for transmission of courses to off-site locations, including to Island County Extension, that will allow undergraduate students and community members interested in individual courses to attend classes with limited commuting. Next steps for the program include increasing recruitment efforts to engage regional community college students, high school students, military veterans, and stakeholders searching for further education. In addition, more distance-learning centers, such as at the WSU Mount Vernon NWREC, will be gradually sought out to maximize convenience for the commuting student population. Finally, engagement with industry members is essential for the success for the program, and there are growing opportunities to host student interns as the program progresses. 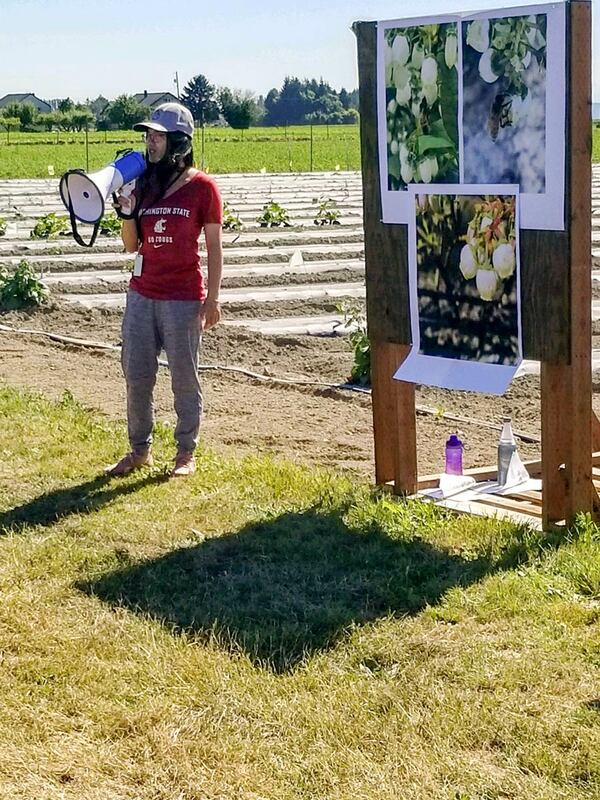 To learn how to transfer to WSU Everett or take OSA classes, please contact Bri Ewing, WSU Mount Vernon NWREC fermentation specialist, at bri.ewing@wsu.edu and visit the WSU Everett website for more information.